Land Rover BAR dipped her wings in support of Sport Relief's 'Hell on High Seas' team today in a Solent flyby. The British Challenger for the 35th America's Cup met the Sport Relief team in their offshore race machine as they battled out of the Solent. 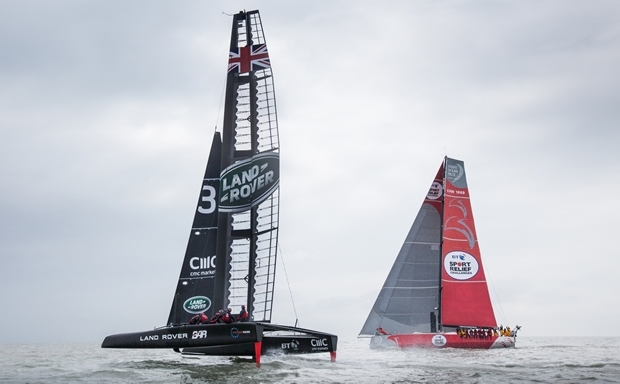 The two contrasting craft made an extraordinary sight as the Cup team's foiler blasted past. Volvo Ocean Race winner, Ian Walker has led the 'Hell on High Seas' team, with One Show host Alex Jones, Angellica Bell, Ore Oduba and Suzi Perry, and comedians Hal Cruttenden and Doon Mackichan aboard. They have been battered by storm force conditions on their journey from Belfast to London in support of the charity.